AVAILABLE FOR 7 NIGHT MINIMUMS IN HIGH SEASON AND 2 NIGHT MINIMUMS FROM FRIDAY TO SUNDAY IN OFF SEASON. PLEASE INQUIRE IF YOU REQUIRE DIFFERENT OFF-SEASON ARRANGEMENTS. Welcome to your private waterfront escape at one of the best destinations within Prince Edward County. Shamrock Cove is a special place to reconnect where you can enjoy fun with the whole family during the day then relax in the serenity of an evening sunset overlooking the bay into the night. Be sure to bring binoculars, the starry sky on a clear night is breathtaking. This beautiful waterfront bungalow on Morrison Point overlooking Smith's Bay has three bedrooms and extra sleeping space in a charming Bunkie with pine floor and ceiling by the water’s edge. The fully equipped kitchen with eating area provides a walk-out to the upper deck with heated swimming pool with 1600 square foot deck, outside eating area, lounge chairs and a Napoleon gas bbq. The living room boasts a large window providing amazing views of the lake and comfortable seating including 3 recliners to relax in while you enjoy the view, play a game or watch a movie on the flat screen TV. The dining area comfortably seats 6-9 people. The main floor has a master bedroom with a king size pillow top bed and large armoire, a second bedroom with a queen size pillow top bed and a third bedroom with a double/twin bunk bed that sleeps 3. As all bedrooms are on the raised main level just 2 steps from the living room this space is comfortable for people with mobility challenges. The bright 4 piece bathroom has a large glass block window, shower doors and spacious vanity. Bed and bath linens are supplied. Shamrock Cove has a beautiful waterfront, with 80 feet of shoreline, a 20-foot dock for sunbathing, fishing and safe and easy access to the water for all ages by water stairs in addition to the shoreline. There is a gradual access to the lake with a gradual slope to 4 feet depth. From the dock you can see the Waupoos Marina across the bay where you can easily launch your boat and dock at Shamrock Cove. Amenities include heated pool, central air-conditioning, ceiling fans, washer, dryer, dishwasher, microwave, outdoor Napolean propane BBQ and lots of cupboard space. Also included: Satellite TV, Wi-Fi and DVD player. This is a smoke-free and pet-free home. Shamrock Cove is for discerning guests and families looking to relax in comfortable surroundings with modern amenities. 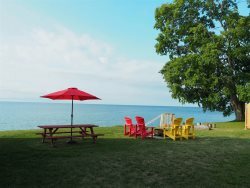 Short Drive: Wine tours, the County Cider Company, shopping in Picton, Bloomfield and Wellington, Sandbanks (free pass is available for one car at Sandbanks Provincial Park), Blueberry picking, Fine dining (many choices), Mustang Drive In. At Home: Swimming, Boating, Fishing, Stargazing, Playing and relaxing…. When was the last time your family sat down to a good game of Monopoly…? Two (2) park passes are included. Parking is available for up to three (3) cars. Off season stays must be Friday to Sunday for a 2 night minimum. Please inquire if you require different arrangements. There are two tables inside for seating. One seats 6, the other seats 4. Amazing time once again! Thanks. Amazing! I would love to live here! It's got everything we need! Thank you for sharing your oasis! What a beautiful place! The house, the pool, the deck - just amazing! We love it here! So many happy memories made! Cet endroit est incroyable! Nhesitez pas a reserver! . Lendroit manque de rien et lemplacement est ideal. Un endroit calme et paisible ideal pour la detente. Nous y retournerons assurement! Adored our stay here! The view, pool, lake & accommodations were great! Adored our stay here. The view, pool, lake and accommodations were great! Amazing time once again! Thanks! Perfect spot - the lake the pool...we all loved it! Lovely surroundings and beaches. We hope to be back! The weather was perfect, the property was beautiful. It was the perfect getaway for our Bachlorette weekend. Thank you so much! Thank you for this peaceful haven! My family enjoyed the time spent here together! What a gorgeous spot! The kids loved the pool and the Disney movies! There was something for everyone. We loved it! Thank you. Thanks for sharing this peaceful spot. we enjoyed the perfect sunset every night! Loved having access to the canoe. Thank you for all the thought put into making this a holiday treasure! Thank you! We enjoyed the pool and the terrace! Thank you for providing a great vacation for us. Our family enjoyed it fully. I think it spoiled us as they would love to return here. You made our stay most memorable. We are going to miss the gorgeous sunsets! Thank you. We had a wonderful time at Shamrock Cove, and the house is very comfortable and well equipped. Thank you! This is a wonderful property!! Everything was amazing. This house is a bungalow. All bedrooms are on a raised level by 2 steps from the living room. Bunkie at waterfront has its own deck and futon bed that can sleep up to 2. There is no washroom in the bunkie nor air conditioning but screened windows and breeze off the lake keep things cool. This property is carpeted throughout. Stairs from the dock are gradual with 2 handrails so easy access for children, seniors and persons with mobility issues. Waterfront has gradual entry. The bottom is sandy with some weeds. The pool does not open till May long weekend. 2 WEEK+ HIGH SEASON STAYS ELIGIBLE FOR DISCOUNT. PLEASE ASK. Travel time to nearest swimming area: < 5 minutes- Minutes from fresh County produce at Vicki's Veggies and County made cheeses at Black River Cheese.